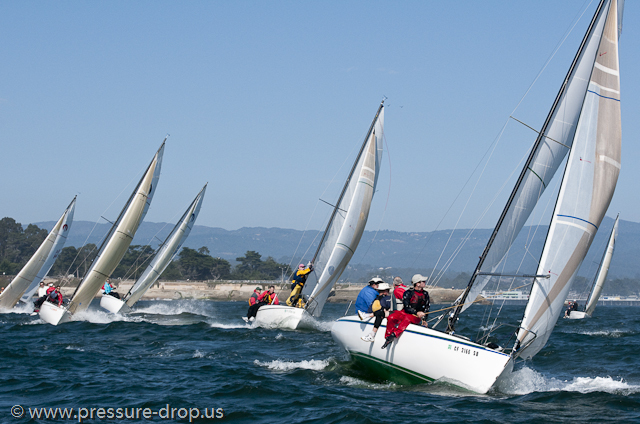 It’s a bright, sunny afternoon in early October 2010 and a fleet of 30 Moore 24s are sailing their North Americans out of Santa Cruz Yacht Club. I’m in the hills above Santa Cruz and I’m standing in a redwood grove on the spot where the plug for a boat named Grendel, the predecessor to the Moore 24, was almost destroyed. Grendel was designed and built by the legendary yacht designer George Olson with his friend Wayne Kocher in an effort to capitalize even further on the success they had had with a previous boat named Sopwith Camel. The center of Olson’s boat building empire at the time was near the Santa Cruz Harbor, and John recalls. “They made the Grendel plug right over on 5th ave. Those houses used to rent for fifty or a hundred bucks. And Grendel was out there in the driveway.” Now an area of multi-million dollar homes, it’s hard to imagine building a boat there. George and Wayne were each going to build a boat off of the male mold, but during the construction of Wayne’s hull, the barn where it was being stored burnt to the ground and the boat was reduced to cinders. 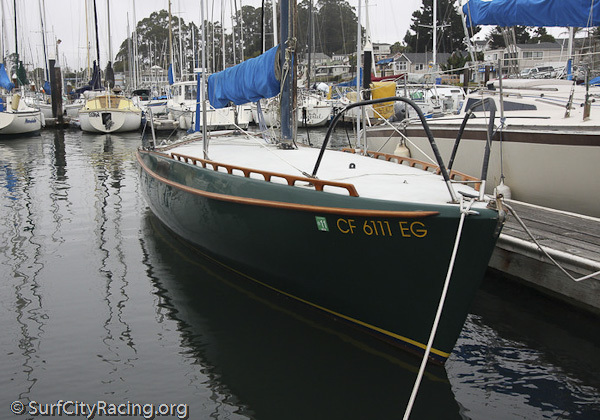 John Moore recalls, “They built two fiberglass hulls and one of them, Wayne’s, was towed up to Bassano’s (the barn), and the mold was thrown over the bank… then the barn burnt down, and Wayne lost the boat.” Luckily, Grendel was safe and sound down in the Santa Cruz Harbor. Project development was on hold. Grendel was sailed enthusiastically almost every Wednesday night, and its intended purpose of being a fun and fast boat to sail was realized. John adds, “At that time, the interest for boats under 30 feet was called M-O-R-C, so George campaigned Grendel and it was a fairly successful boat, and he found the shortcomings. 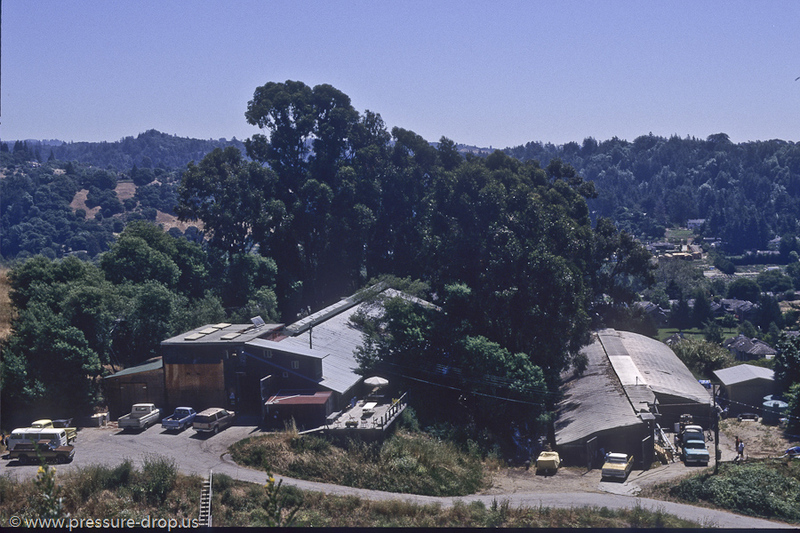 It needed a little more keel and a little more beam.” The male mold sat unused up under the redwoods in the hills above Santa Cruz. Ron Moore to the rescue! Rescue of the Plug from Bassano’s. With the barn reduced to charcoal, and the plug taking up space in the Bassano’s yard, it was time to clean house. Ron recalls, “There’s a little interesting hitch when we went to rescue the plug. Dennis (Bassano) wanted to get rid of the plug. You know, the barn was burnt down, and there’s this mold sitting there. I think it was Dennis’ idea being the crazy guy that he is. He said, ‘Let’s take this thing and push it off of the cliff and ride in it down into the ravine. And probably after a bunch of Budweisers or something it sounded like a great idea. I stopped them and told them that I’d build a boat off of it.” Grendel’s plug was spared. Let’s back up for a second. How did Ron and John get into boat building in the first place? 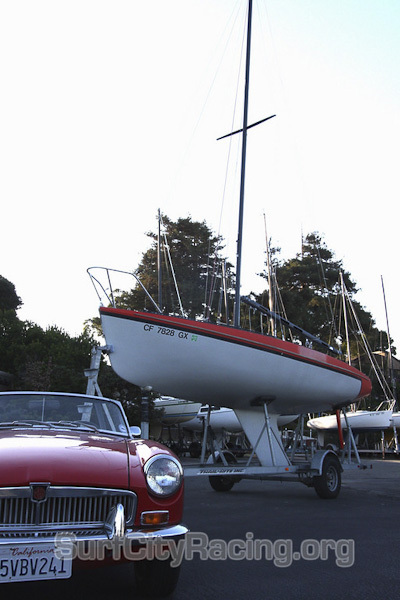 They started off by building surfboards and Ron worked for another powerboat builder over the hill from Santa Cruz. John remembers, “We had a boat shop trying to make other kinds of boats like 5o5s, Jester Dingys, El Toros, what ever it took to keep the doors open.” And this from Ron’s perspective, “We were building surfboards at the time next to my parents house, the 1971 5o5 Worlds were being held in Santa Cruz and I just fell in love with the beauty of the hull. I analyzed the design and thought that I could make an all composite one, with minimum weight, using average materials.” So, as you can tell, the innovation within Moore Sailboats started early. John recalls “So, we got the mold and we took the bulkheads out of it, we took the stations out of it, it was 1X1 redwood plank, and we stretched it out…But when you do that, the sheer does this, it gets kind of funny (curves hands in a funnel shape). I think that’s why the nose is kind of…it’s a little off. It’s not a perfect symmetrical boat (laughs).” Then we took a male hull off of that and it became Summertime. 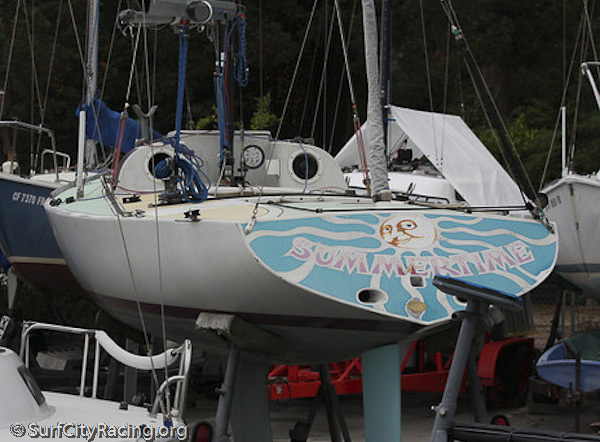 We just faired it, we didn’t make a mold off of that, we made a complete boat and sailed it around for I think a year or two.” Summertime was born, and can still be seen sailing (and winning races) in the waters off of Santa Cruz today. 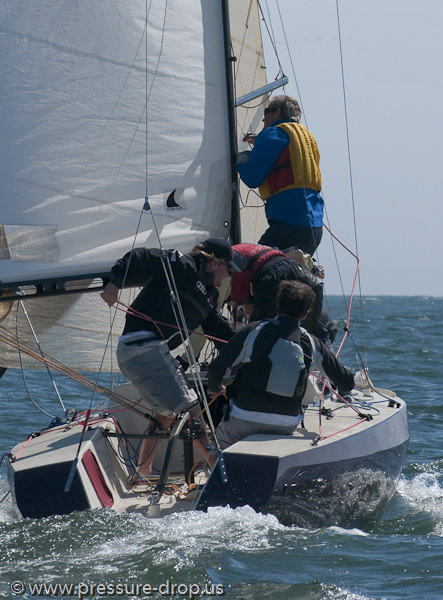 What about the famed asymmetrical hulls? Yeah, they’re lopsided, but as Ron points out, “The thing that makes the hull asymmetrical is the way that I pushed and the way that the material yielded. Everybody likes to say it’s 2 inches off, but they’re lying motherfuckers. It’s an inch and a half, but technically, if you go from the centerline, it’s 5/8th of an inch off. 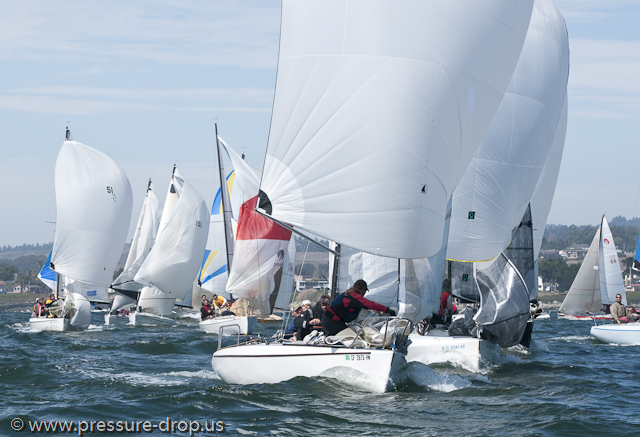 Not bad for total back yard, Oakie endeavor.” I asked some of the top sailors at this year’s Nationals if the boat had any noticeable characteristics on either port or starboard that they could attribute to the hull being off kilter. They had nothing. Summertime made asuccessful Wednesday night Beer can campaign debut and caught the eye of several of the Moore brother’s friends and the suggestion was made to build a few more at The Reef. John, adds, “Summertime was just supposed to be, you know, a Wednesday night fun boat to sail, and it still is! After a while we started to think, ‘this thing goes pretty well’. I can’t remember who said it, maybe Jack Halterman or Rob Wade, or someone. ‘We should build a couple of these.’ The AP was down and it was time to put on their game face. They made a mold off of Summertime and went into production. The first few boats are difficult to trace, but several of them can be found in various places around Santa Cruz and The Bay Area. John comments on Ruby, the 1st official Moore 24 “Ruby, the oldest boat sailing in this event (the current 24 Nats) I believe, and was our shop boat. It was supposed to have been my boat.” Ron agrees, “Up until hull number 5 the boats were kind of crude, Ruby is the first one I really called a Moore 24.” Ruby just had a major refit, including the addition of an open transom, by the ‘Fleet Surgeon’ Craig Smith, owner of Elkhorn Composites in Watsonville. More on Craig in a moment. 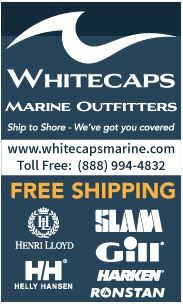 What about when the boats get wrecked or go under the knife for a new-fangled open transom? Enter Craig Smith, the fleet’s surgeon that I introduced you to earlier. Craig is the ultimate composites engineer, he can fix just about anything that’s made out of resin and glass. Smith is a philosopher; he gets into the soul of the boat and repairs it with his brand of esoteric magic that emanates from 80 grit sand paper spinning on a grinder or from gel coat that sprays from the tip of a spray gun. Craig is a magician; He can make the evidence of a bad day of racing disappear with a touch from his artist brush. For various reasons, several owners have installed open transoms, Craig has installed 4 of the open transoms and has done countless repairs for the Moore fleet, he explains, ”On occasion, boats get damaged in a way or they’re neglected in such a way and it becomes eligible, and because a gentleman named Gary Tracy did it. 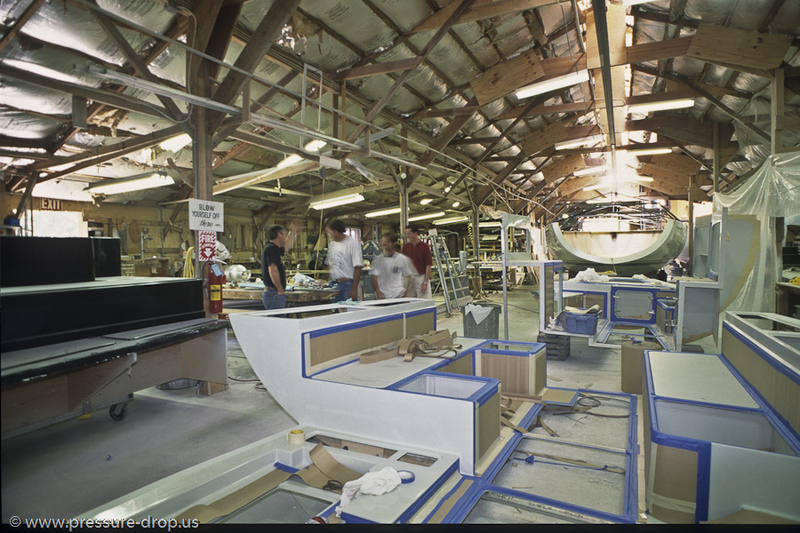 He took a reject hull out of Moore’s yard that was non-numbered hull, he took it up to Bill Lee Yachts and rented a deck mold from Ron Moore and had this idea to make a modern looking boat. So he led the way. Some people liked it so they ordered open transoms from ‘Garsky’ and he probably did 6 or so before he passed away. Before he died, he sold his boat, Bruzer to Morgan (Larson).” The open transom isn’t just for looks, it allows the cockpit to drain faster and gives a little more room for the driver and crew. 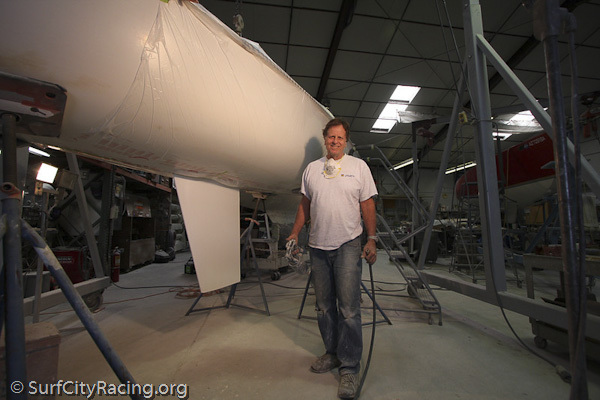 The open transom isn’t just for looks, but hey, if it looks cool too, Craig Comments, “The boats are anthropomorphic. I get two or three boats in here and people are always drawn to the Moore 24. They look at the other boats that look like That 70s Show and with the Moore, if you open the transom up I looks like a modern boat. It’s a timeless shape that nobody can claim as their own.” Craig’s fondness for the Moore shines through. The open transom isn’t for every boat, but if there’s a need to get into that area it’s much easier to cut the deck out rather than crawl into that tiny space, “I had a major repair to do on a boat called Moore Havoc that was rear ended on the way back from the Ditch a few years ago, and instead of crawling back in there, we made the decision to just open up the transom. I took a mold off of Bruzer, built the part, and put it together. All together we’ve done four of them. 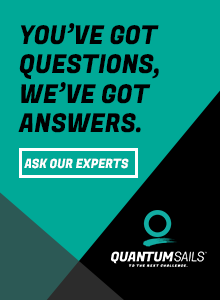 I won’t cut into a nice boat, they have to be eligible.” It takes about 50 hours and some mad fiberglass skills to pull off an open transom conversion. Three of the top four boats have been into Elkhorn Composites in the past month having various things repaired, so I asked Craig if his service had anything to do with the high placement in the regatta. “We tart them up. I won’t call it fairing because we’re not templating anything. 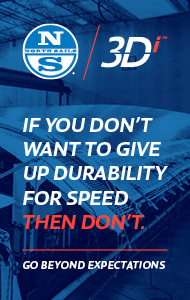 We’re not adding putty, it’s more like precision sanding. We do a nice job sanding the bottoms and I pays off, the boats are squirty like little watermelon seeds. We always leave the inconsistencies in the hull, like there’s always a little crooked part abaft the keel, it’s always there. The molds were so hokey…so we maintain a certain level of crappyness in all of our Moore work. We’re not doing what some people would like us to do, make them perfect, they’re inherently imperfect.” So yeah, maybe Craig had something to do with the boats performing well, but we’re talking about Morgan Larson, Philippe Kahn and Dave Hodges, three ‘A’ fleeters to say the least. 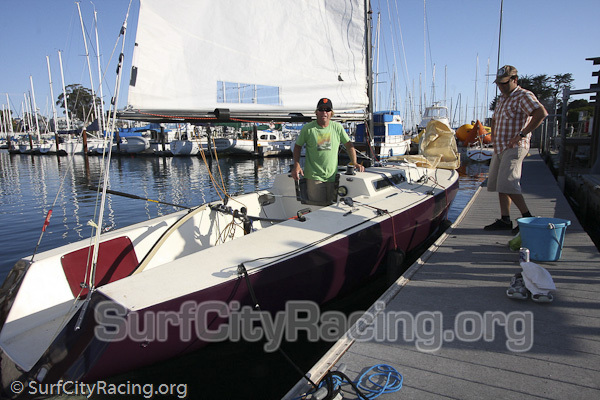 Local Philippe Kahn, known for going big on Open 50s across the Pacific, joined this small localized fleet, showing that you don’t need a giant, expensive toy to come out and have a good competitive time racing. Hats off to Pegasus for making the effort to get a boat dialed in for the Nats! 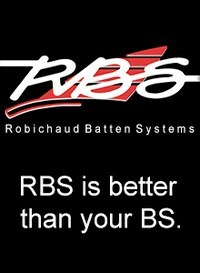 It’s cool to have the support of such a legitimate syndicate in such a small hometowny-feeling fleet. The races started in light winds and a decent South Swell. The wind was from the North West, starting out Easterly in the morning then completely dying out in the afternoon. 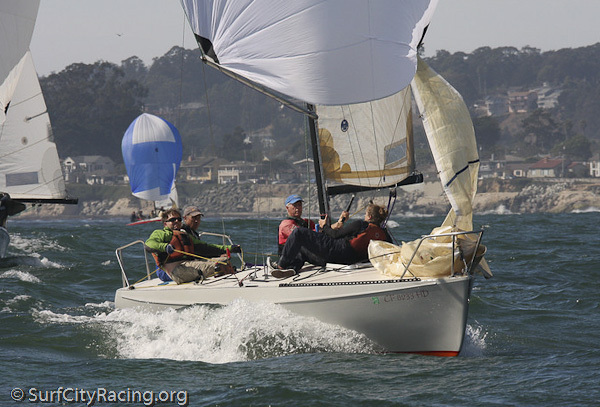 In race one, Bruzer crossed the line first, with the oldest boat in the fleet crossing in second place and Pegasus- Motion X in third. In Race 2, Eight Ball took the first spot and local boy Dave Hodges on Adios crossed in two followed by Pegasus. The boats gratefully accepted a tow from Outrageous. On Saturday, the three races were started a little more offshore, with the wind picking up in the afternoon to around 15 to 20 knots. The boats went out on their long course, all the way up to Natural Bridges. The sleigh ride downwind wasn’t harrowing like it usually is, but it wasn’t benign either. Good fair racing! Sunday saw a thick fog bank sitting offshore, and many sailors foggy from the evening before spent at Brady’s Yacht Club indulging in some of Santa Cruz’s finest…rum. The Race Committee was able to fire off three races, and all said and done, Bruzer took the title, followed by Eight Ball and Pegasus- Motion X. 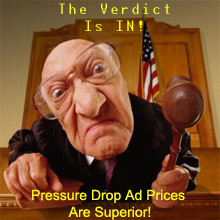 We got massive amounts of pics and the results. 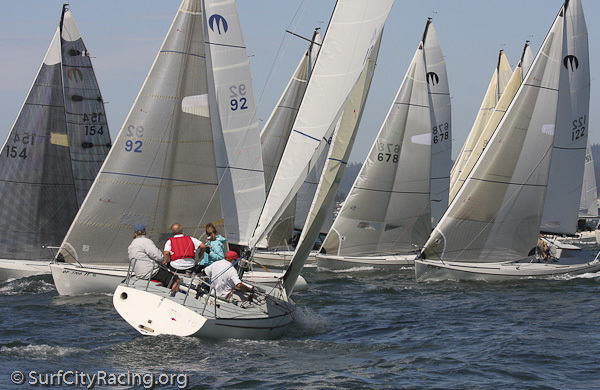 Thanks to the Moore Fleet and the Yacht Clubs for an outstanding regatta.